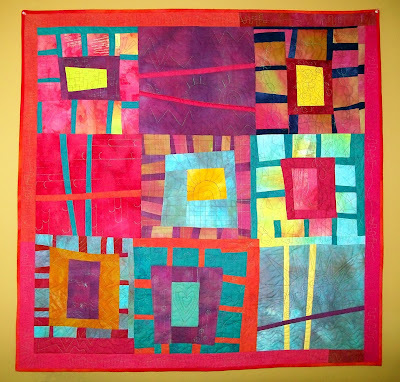 new faces to our community and want to provide a forum for quilters who are still developing their skills. We begin at 6:30 with a potluck and sometimes wine. We all bring something to share (bought or prepared), including our own table service. At 7 pm, we have Tips & Tricks, which includes a short demonstration for about 20 minutes. After that, there is time for show and tell and/or time to work on individual projects. At 8:45 we start folding up and depart by 9:00. We meet the second Thursday of every month, except not in December. Changes to the schedule will be noted in the EBHQ newsletter and at meetup.com (meetup.com/East-Bay-Quilters-Group/). The location is the same as for the drop-ins. EBHQ members attend at no cost, and visitors are charged $5. There is no fee for those who join the guild at a meet-up. If you’d like more information about the guild and its members, sign up to receive postings from EBHQ's blog at www.ebhq.blogspot.com or see the Member Active Sites/Blogs.